ArcGIS Desktop is a 32-bit application. Background processing was introduced at the 10.0 release which allowed you to run geoprocessing tasks as a background process. This freed you up to do other things while your process was working away in the background. However, this background process still ran in the 32-bit world. At version 10.1 SP1, 64-bit background geoprocessing was introduced. If you had a 64-bit PC, you could install this extra piece of software to take advantage of your 64-bit architecture. Installing 64-bit background geoprocessing will replace your current 32-bit background geoprocessing. All scripts, models, and tools which execute in the background will use a 64-bit process. Your biggest benefit when using 64-bit background processing is that your large 64-bit processes can take advantage of more memory (if available) than when using 32-bit processes (the 3gb barrier). So let’s get started. 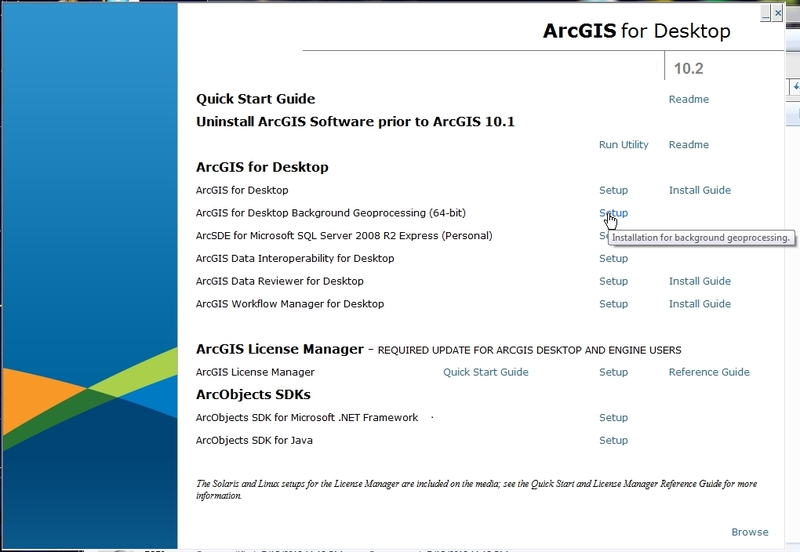 First, you will need a 64-bit PC that has ArcGIS Desktop 10.1 or higher installed on it. You will also need a process that takes some time to run, so you can compare before and after installing the 64-bit background geoprocessing software. I chose to use ArcCatalog 10.2 in my test. Make sure to enable Background Geoprocessing in the Geoprocessing Options menu (accessed under Geoprocessing > Geoprocessing Options). 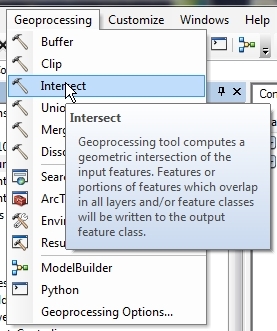 For my test, I chose to use the Intersect Tool under the Geoprocessing pulldown menu in ArcCatalog. I will be intersecting a 5 mile buffer of street centerlines from the City of Burbank with 10 foot contour lines from all of LA County. There are 28,817 records (6.10mb) for the street centerline data, and 1,131,734 records (2.34gb) for the contour lines. Why would I want to do this? I don’t know, but I wanted two large data sets to try this on. After adding the two data sets to the Intersect Tool, I ran the tool and it took off running in the background. 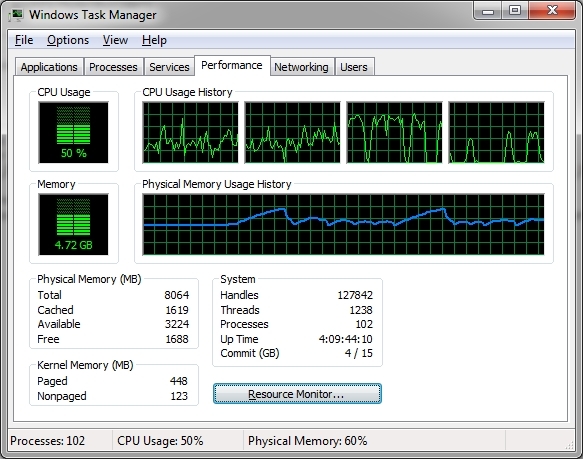 Bringing up the Windows Task Manager shows my CPU and memory usage during the run. I could see the process seemed to only take up 3 of the 4 CPU cores and memory usage was constant. I had other programs open at the time so memory usage was up more than usual. 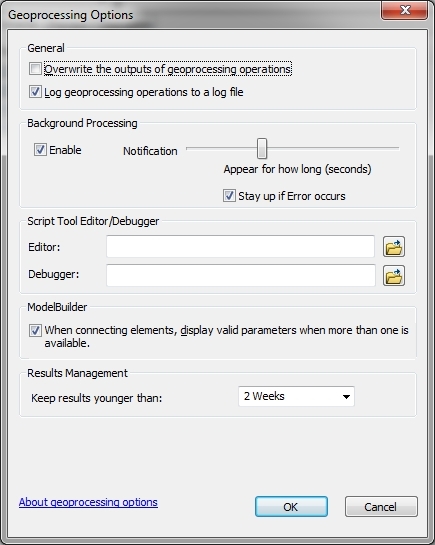 Once the tool finished, the results could be displayed in the Geoprocessing Results window (accessed under Geoprocessing > Results). 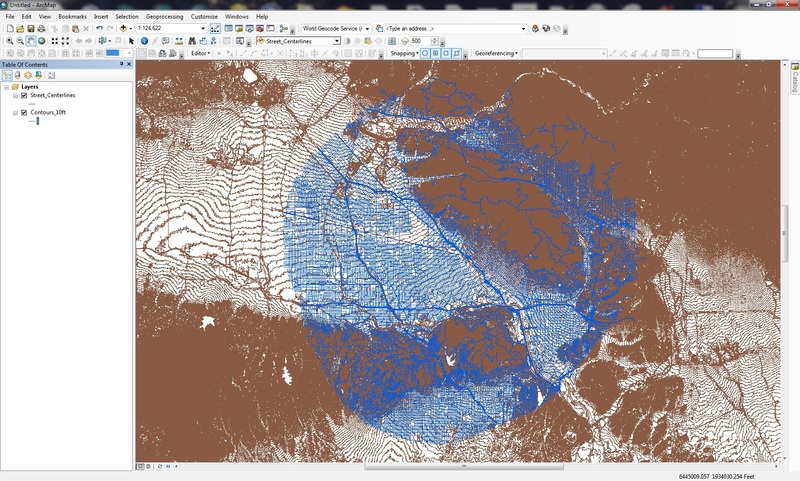 The intersect process took 7 minutes and 30 seconds to complete using 32-bit background geoprocessing. Ok, so now let’s install the 64-bit Background Geoprocessing software. Close all ArcGIS applications first. Find your ArcGIS Desktop CD or you can download just the 64-bit Background Geoprocessing install file from ESRI’s customer care site. I have the CD, so I start it up and choose 64-bit Background Geoprocessing. During the install, two things happen. The 64-bit binaries for Desktop are installed under your_arcgis_software_location/ArcGIS/Desktop10.2/bin64 and 64-bit Python is installed under your_python_directory/ArcGISx6410.2. I will talk about Python later and things you should be aware of after this install. Now with 64-bit background geoprocessing installed, I startup ArcCatalog and run the Intersect Tool again to see if processing is faster. 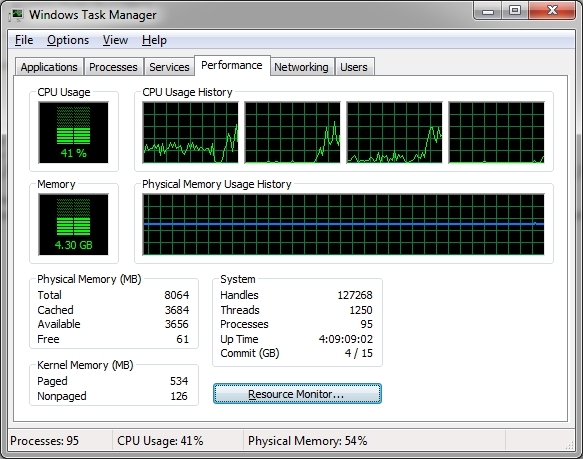 While it ran, I did notice all 4 CPU cores were utilized, CPU usage went up, and more memory use and fluctuation. My process ran a little faster lasting 6 minutes and 14 seconds, or 1 minute and 16 seconds faster. An almost 17% improvement. Frankly I was expecting something like half the processing time. Maybe a better test would be using a 32-bit PC and compare to a 64-bit PC. I just had my 64-bit PC to compare both, so maybe it was helping the 32-bit process a little. Not sure. Please post a comment if you have an idea why. I have heard that with 64-bit processing you can see a 20% improvement. Now for Python. As stated earlier, the 64-bit version of Python gets installed as well. This is for the geoprocessing tools in ArcGIS Desktop. If you are into writing Python scripts, and you want to take advantage of 64-bit, you will need to make sure to run your scripts against 64-bit Python. Typically the last version of Python installed, by default, will be the one you execute against when double clicking a python script from Windows Explorer. If you last installed 64-bit Background Geoprocessing, you will probably be executing against 64-bit Python. You can always change which program executes when double clicking a file in Windows. When I open my Python window, I see that it is running the 64-bit version. Keep in mind that if you installed 3rd party Python tools, you will need to get the 64-bit versions. For example, if you installed SciPy, you will need to download and install the 64-bit version as well. Also, if your background processes (or stand alone Python scripts) accesses data in an Enterprise Geodatabase, like SQL Server or Oracle, you will need to install the 64-bit client libraries for those databases on your PC so the process/script can connect to those databases. ArcGIS Desktop will continue to use the 32-bit libraries, and background processes/stand alone Python scripts will use the 64-bit libraries. Lastly, if you uninstall the 64-bit Background Geoprocessing program, I found that when I tried to double click a Python script, it could not find the 32-bit Python program. I had to re-associate .py files to the 32-bit executable. ArcGIS Desktop seemed to work fine though. It was just a matter of time! Check out the bars you can get to via Metro’s rail system. The bars are within a 10 minute walk from the station. The 2014 ESRI User Conference Proceedings are available for viewing. Included are papers, presentations, case studies, and technical workshops. The 2014 National Transportation Atlas Database, which has GIS data for transportation, was released last week. It is available for free on DVD from the U.S. Department of Transportation. The DVD is a set of nationwide geographic databases of transportation facilities, transportation networks, and associated infrastructure. These datasets include spatial information for transportation modal networks and intermodal terminals, as well as the related attribute information for these features. Metadata documentation, as prescribed by the Federal Geographic Data Committee, is also provided for each database. 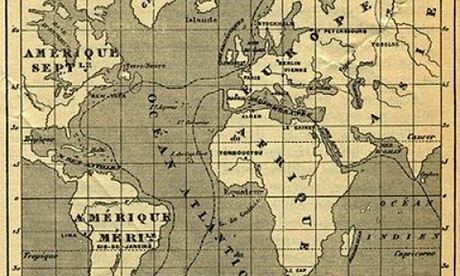 Can you identify the book from its map? Click the map below and try the quiz! Stanford University Library has started preparations to receive the David Rumsey Map Collection. David Rumsey began gathering his map collection over 25 years ago and announced in 2009 that it would be donated to Stanford. According to Rumsey, technology has risen to the forefront in the University’s plans for the collection and the map center. Computerized tools, such as video and touch-sensitive walls, will be available beside the physical maps. ArcGIS will also be incorporated. Kristina Jacob from the City of Santa Clarita is sharing her photos from the 2014 ESRI Conference. Check them out!